Today at the Consumer Electronics Show in Las Vegas, Sony Video & Sound Products Inc., operator of Sony’s video and audiobusiness, announced “360 Reality Audio” a new live music experience so immersive that it will make music fans feel like they are front row or side stage at a concert. To underscore the power of this technology and its unique offerings, Sony partnered with select Live Nation Clubs & Theaters to capture audio from an array of concerts including The Wombats, AJR, Good Charlotte, Chris Lane, Jorja Smith, Kodaline and more to be announced. 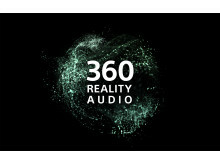 360 Reality Audio produces a three-dimensional sound field where the different sounds and musical elements can be projected from anywhere inside a 360-degree space, powered by Sony's object-based spatial audio technology. In the future, fans can access the audio content by using BLUETOOTH® headphones and selecting the 360 Audio logo featured on Deezer, nugs.net, Qobuz, and TIDAL where they can choose from a selection of the aforementioned artists to relive the magic of live. Sony will also be developing iconic branded art installations of the headphones at Live Nation venues throughout the country including, Hollywood Palladium (Los Angeles), House of Blues Chicago (Chicago), Irving Plaza (New York), The Fillmore (Philadelphia), The Masonic (San Francisco) and The Wiltern (Los Angeles). Live Nation is the world’s leading live entertainment company comprised of global market leaders: Ticketmaster, Live Nation Concerts, and Live Nation Sponsorship. For additional information, visit www.livenationentertainment.com.